The most popular gaming hardware these days tend to be the kit that has gaming-focused 'special treatment'. To satisfy such needs, numerous companies introduce separate brands to address requirements of the gaming crowd, or just release special products. ADATA on Wednesday introduced its new XPG Gammix S11-series SSDs - the value-add for gamers is the red heat spreader, which according to ADATA is designed to ensure consistent performance of the drives and to match gaming systems with red and black color schemes. The ADATA XPG Gammix S11 M.2-2280 SSDs are essentially the company’s XPG SX8200-series drives based on Silicon Motion’s SM2262 controller (eight NAND channels, four ARM Cortex-R5 cores, NVMe 1.3, LDPC ECC, RAID engine, etc.) using 64-layer 3D TLC NAND memory from Micron. From a performance point of view, the XPG Gammix S11 drives offer exactly the same numbers as the XPG SX8200 do: up to 3.05 GB/s sequential read speed and up to 1.7 GB/s sequential write speed when SLC caching is used (data based on ATTO benchmark), as well as up to 310K/280K random read/write 4K IOPS. Endurance and other features of the XPG Gammix S11 and the XPG SX8200-series are also the same. 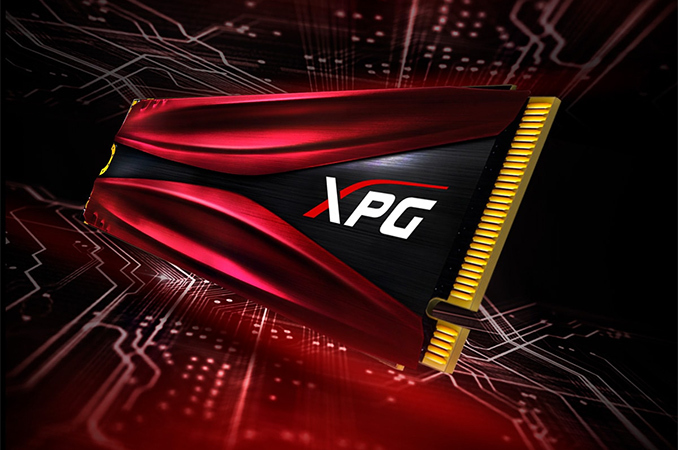 The key difference between the XPG Gammix S11 and the XPG SX8200 SSDs is a pre-installed red and black heat spreader on the former. By contrast, the latter drives come with a black heat spreader that ships in the box and has to be installed manually. The passive cooler can reduce SSD controller temperature by 8-10°C, or even more with appropriate airflow. Heat spreaders and proper cooling can be important for modern SSDs since contemporary controllers dissipate quite a lot of heat. This is due to the nature of performing intensive mathematical operations while using ECC based on LDPC algorithms, as well as working with contemporary NAND flash memory, and ensuring both endurance and high performance. Therefore, a pre-installed heat spreader on the Gammix S11 can make a lot of sense for gamers if their storage devices perform tons of read operations when they load games. The ADATA XPG Gammix S11 drives will be available in 240 GB, 480 GB and 960 GB configurations in the coming weeks. The manufacturer does not disclose pricing, but it is highly likely that MSRPs of the "gaming" SSDs are going to be similar to prices of the XPG SX8200 products. At press time, the XPG SX8200 240 GB drive retailed for $140, whereas the XPG SX8200 480 GB SKU was available for $260. seems "ok" IMO, but, how thick are the heatspreaders is important as well am sure at least some motherboards if the heatspreader is too thick will make impossible to use (such as the ones that use heatshield, or fancy "clips" for use on reverse side of motherboard. I do like the look of them however...I wonder why I have never seen one that uses a thin spreader with heatpipes off towards the rear edge to help dissipate more heat quicker? ~$311 CAD for 480gb is pricey though IMO, need real world testing vs other NVME style drives because "specs" only matter so much. "A pre-installed heat spreader on the Gammix S11 can make a lot of sense for gamers if their storage devices perform tons of read operations when they load games." No. Loading games is actually one of the least loads for an SSD.